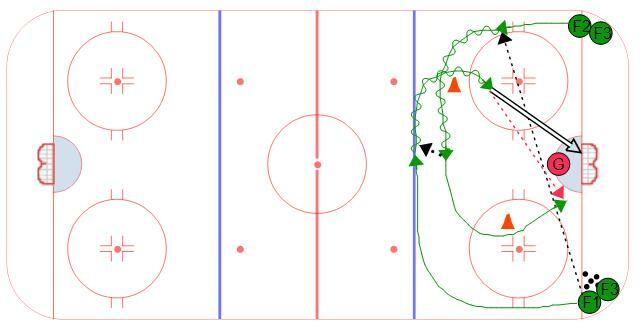 Some people may categorize this hockey goalie drill as goalie abuse, but it is a good, fast paced, drill that can be used in half-ice situation. To set up, place two pylons as shown in the diagram in a staggered position. The pylon closest to the line of pucks should be closer to the goal line. This allows the player to get to the net slightly before the other player. The drill starts by the first player (F1) making a pass across ice to the other player (F2). Both player skate around the pylons and cross in the middle of the ice. The player with the puck 9F2) should skate in front of the other player (F1) and leave a drop pass to their forehand. Both players continue around the pylons. The player with the puck (F1) will either shoot or make a pass to the player driving the net (F2). The goalies need to respect the shot and the pass. The player with the puck should try to disguise the pass by getting the puck in shooting position. We have some additional great drills for the netminders, be sure to check out more of the drills for on goalies.